It’s our honored to announcement that KS Aqua Engineering Company and Qianhai KS Aqua（Shenzhen）Engineering Company is sole authorization distributor in Hong Kong, Macau and Mainland China. Aquavia Spa is the biggest European spa manufacturer, with worldwide presence since 1988, and the widest spa range to satisfy a variety of needs. It is impossible not to find a spa that meets your needs in the catalogue, for domestic or residential use, for commercial use, groups or sport. All Aquavia Spa jacuzzis are designed and manufactured in Europe, with high quality material and components, providing absolute reliability and durability, to surpass their lengthy guarantee periods. "Avant-garde design and integration into any architectural or decorative space" The materials used for construction have an elegant design, with the highest quality material and most exclusive finishes. This is especially true of the select spa range, where fine woods are combined with polished stainless steel. Each jacuzzi at Aquavia Spa maintains a high standard of quality, with attractive, cutting-edge design, optimal energy efficiency and commitment to the environment, options for crystal clear water, ozone therapy systems, alternative therapies, complete body massage circuits and ergonomics to enjoy the small pleasures provided by a jacuzzi to the full. 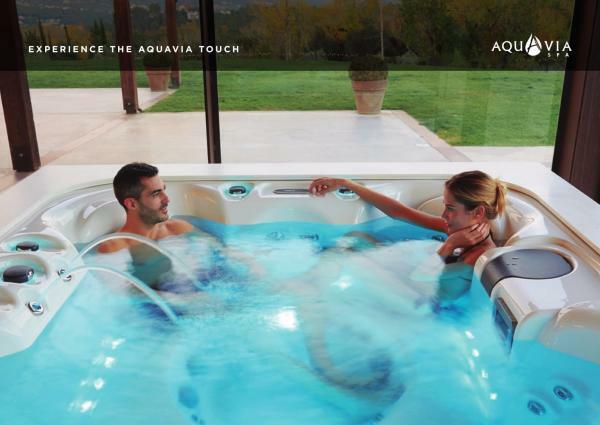 Aquavia Spa will be attending Spatex Aquavia Spa is kicking off 2018 at the Spatex trade fair, the largest swimming pool and hot tub trade fair in the United Kingdom, which is held in the city of Coventry, on 30 and 31 January and 1 February. Spatex, is a trade fair that represents all sectors of the swimming pool, hot tub, steam bath and children’s play equipment industry, in both the domestic and commercial arena. Additionally, every year, the trade fair has seminars and technical workshops that are held by experts, bringing together visitors from Europe and across the world. The Aquavia Spa team will be at stand C52, to inform all of the visitors about the brand’s latest innovations for 2018.